On Washington state’s tiny Lummi Island, chef Blaine Wetzel forages land and sea for his pilgrimage-worthy tasting menus at The Willows Inn. Writer Daniel Duane follows by foot, bike and kayak. Blaine Wetzel’s foraging run starts in the predawn glow. It is just before 7 a.m. when Wetzel, guide Mike Passo, my wife and I drag long fiberglass kayaks out of a big shipping container and into the shallow water. Then we zip up life vests and paddle along a rocky shoreline where bald eagles perch in the evergreens, watching the sunrise light up Mount Constitution on green Orcas Island. A pale, earnest young man of 26, with thick dark hair and Abraham Lincoln–like features, Wetzel worked for 18 months at the groundbreaking restaurant Noma in Copenhagen, where René Redzepi practically invented cold-climate locavorism. 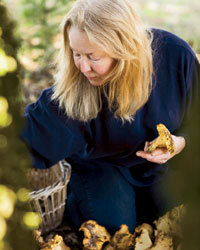 Now, Wetzel is chef and part-owner of The Willows Inn on tiny Lummi Island (population 964), 100 miles north of Seattle. Moments later, we paddle up to a cluster of rocks jutting out of the sea. “That emerald green stuff is sea lettuce,” Wetzel says. I pull up my sleeve, plunge my hand into the frigid water and yank up a handful. “Go ahead, taste some,” Wetzel says, smiling. “It’s really good.” It is—tender, briny, refreshing, like an excellent seaweed salad. Wetzel points out another seaweed that he likes to dry and crumble into powder, creating a kind of umami salt. Then he sees something he doesn’t recognize, so he calls over to Passo. Wetzel harvests a few pounds, packing it into ziplock bags for experimentation back at The Willows Inn. Wetzel gathers edible seaweed by kayak; travelers can tag along on foraging tours. Photo courtesy of Mike Passo. People from around the world come to The Willows Inn on Lummi Island. Photo © Charity Lynne Burggraaf. Wetzel’s cherry blossom ice cream with verbena granita and wildflowers. Photo © Charity Lynne Burggraaf. Geographically speaking, Lummi (it rhymes with “dummy”) counts as a San Juan Island, a prime vacation spot in the Pacific Northwest. But the main car ferry for the San Juan Islands, where Bill Gates’s and Paul Allen’s families own homes, doesn’t stop at Lummi. To get there, my wife and I drove an extra hour north, crossed a Native American reservation and rolled down a wooden dock onto the tiny Whatcom Chief, a rusted ferry fitting 20 cars bumper-to-bumper. Waves splashed our windshield during the six-minute crossing. Lummi turned out to be oblong, with a mountain at one end and a single 17-mile road. There are no gas stations and no stoplights, and the modest, century-old Willows Inn is the sole hotel. In fact, the only other businesses on the island are a couple of farms, the general store, the post office, one little family restaurant, an art gallery and Passo’s Elakah Expeditions kayaking operation. Even on a hot summer weekend, you could easily nap in the road without getting run over. The story of how this small, obscure and isolated island turned into the home of one of America’s most exciting new restaurants begins in the 1970s, with a local fisherman named Riley Starks. Planting organic vegetables in his yard, Starks backed into a second career as a farmer. Hearing that the old Willows Inn was up for sale, he bought it just to keep it from closing. Then, in 2010, after his cook quit, Starks posted the job on Craigslist. Wetzel replied by email, from Copenhagen, and Starks hired him sight unseen. Wetzel was only 23 years old at the time, and he had never run a restaurant, but Starks nevertheless empowered him to dictate his little farm’s entire planting schedule; hire his Noma buddies to help him run the kitchen; install his girlfriend, Raquel Ruiz Diaz, as the front-of-house manager; and scrap the casual American menu for an 18-course prix fixe. Wetzel then rewarded Starks by treating the little country inn like the headlining spot at Lollapalooza. Two years later, Wetzel was named a Food & Wine Best New Chef 2012; weekends at The Willows Inn book up a year in advance; and Wetzel and a group of local investors are the owners after buying out Starks. Wetzel likes to call The Willows Inn “the best restaurant on earth,” but he’s not being conceited. “I’m not talking about my cooking,” Wetzel says. “I’m talking about everything. Nobody has this,” and he motions to the land and water around him. Right next door to The Willows Inn is its seven-acre farm, which produces 100 percent of Wet- zel’s fruits, vegetables, eggs and pork. The restaurant’s two fishing boats bring in black cod, steelhead and sockeye salmon so fresh Wetzel has to let them rest a day, so the rigor mortis can pass. Another one of the inn’s boats harvests spot prawns within sight of the kitchen, delivering the little crustaceans live into Wetzel’s kitchen tanks. Granger Ranch, a mile down the island’s only road, raises all of Wetzel’s lamb, beef and duck. Wetzel uses all this crazy abundance for a single dinner sitting, only five nights a week, for just 28 guests at a time. The Willows Inn doesn’t look like a destination hotel—the odd-height ceilings and sloping floors make you feel as if you’re in a restored old sailing ship—but it is, bringing in guests from across the globe. Later in the day, after walking barefoot out of The Willows Inn and crossing that quiet road to get to the beach, my wife and I swim lazily in the very same waters we foraged that morning. Wetzel himself appears, strolling down the sand in chef’s whites and carrying scissors and a basket, looking for sea beans to harvest and cure. We borrow bicycles and drift up the road to the Nettles Farm, where Wetzel’s sous-chef is gathering ingredients for dinner. Making our way to Granger Ranch, we stop to gorge on blackberries while watching cattle graze on the bright green pasture. At the next bend in the road, we sit on driftwood and watch the floating platforms of Starks’s “reefnet” salmon operation, one of the more sustainable fisheries on earth. Starks’s crew anchor pairs of 40-foot rectangular barges side by side, then hang underwater fishing nets between them. Then they climb up little metal towers and gaze straight down into the water, all day long, in the sun and silence. Once in a long while, they see passing sockeye and pull up the nets—those sockeye might end up on the menu at Beach Store Café, the aforementioned family restaurant, now owned by Wetzel and his new partners. By the time we return to the inn to change for dinner, we’ve seen the entire island in the space of a couple of hours. Stepping into The Willows Inn dining room—with its softwood floors, white-painted walls and big picture windows—we find Wetzel helping Diaz hand out a series of predinner snacks. There’s smoked black cod with sauerkraut on house-made potato chips; little wooden boxes that, when you lift the lid, release alder smoke, revealing smoked salmon sitting on still-smoldering alder chips. The theatrical courses keep coming: bracing-cold pickled oysters on the half shell, set among little stones frozen into a miniature ice pond and garnished with sour green sorrel shoots; and then, as a contrast, hot grilled oysters bubbling in a sauce of oyster butter and tequila. Redzepi’s influence appears in Wetzel’s spot prawns—pulled live out of tanks, seared outside and left raw inside, and paired with a very Noma-like emulsion of pureed fresh oysters, plus thin disks of quick-marinated kohlrabi and pickled seaweeds. After the prawn, an utterly Northwestern touch: center-cut loin chops from big king salmon Wetzel gets in such abundance that he can take just the two finest servings from each 15-pound fish (the rest is used in terrines or served at Beach Store Café). He serves these breathtakingly rich red rectangles raw, with a vibrant red-orange sauce of pureed nasturtiums. “Three’s up too,” she says, peering into the dining room. Instead of getting tense or annoyed, Wetzel wanders out to the deck and joins his diners as they marvel at the psychedelic colors of a prime West Coast sunset. When everybody drifts back inside to take their seats, Wetzel returns to the kitchen and sends out the last and simplest dish of the night, in colors as vivid as the sunset: sponge cake with big red Chandler strawberries and tiny white alpine strawberries, bright green chamomile sprigs and lavender flowers around an elegant scoop of pink strawberry sorbet. 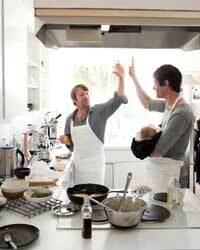 San Francisco–based writer Daniel Duane is the author of the new memoir How to Cook Like a Man. Lummi Island, about a two-and-a-half-hour drive north of Seattle, is accessible via a short ferry ride from the landing at Gooseberry Point. co.whatcom.wa.us. Guests at the rustic 20-room inn, opened in 1910, get first dibs on reservations at Blaine Wetzel’s amazing 12-table restaurant. willows-inn.com. Excursions with this kayak tour operator range from daylong Lummi Island foraging trips, complete with sea- harvested meals prepared on the beach, to longer journeys through the San Juan Island archipelago. Trips from $65 per person; elakah.com; 360-734-7270. A Willows Inn sous-chef runs the more casual of Lummi Island’s two restaurants, preparing pizzas and pastas with locally farmed and foraged ingredients. 2200 N. Nugent Rd. ; 360-758-2233.